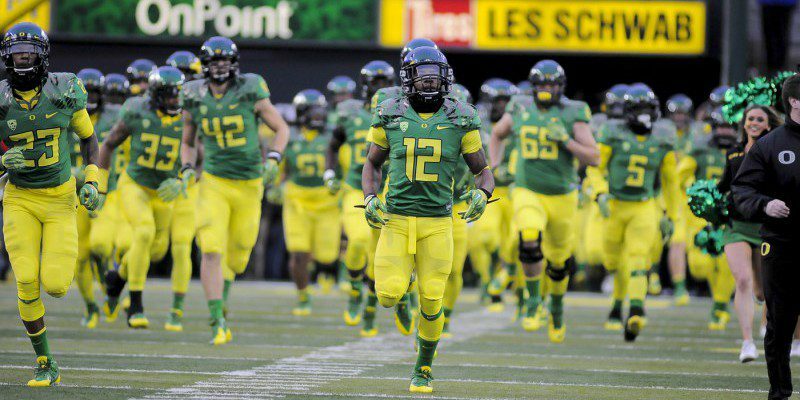 One of the coolest parts about the Oregon Ducks is by far the uniform combinations they get to sport every game. As fans we wait to see what uniform our men are gonna wear on the field next is a big part of the excitement that comes with an upcoming game! Thanks to Nike the options for uniforms are pretty much endless… in fact, there are an unbelievable amount of different uniforms in existence for the Duck football team. According to OregonLive.com, the Ducks have enough different uniform combinations to wear a different uniform every quarter of every game… for the next MILLENNIUM. Kenjon Barner in the 2012 Fiesta Bowl in a beautiful white and green uniform. I know that I get super excited waiting for the uniforms to come out each week during football season since one has definitely never been the same as another but WOW! That’s crazy! By my math, this means that Nike’s designers can relax and take naps at their desk for the next 1,329 years knowing no combination will ever be duplicated. Nike’s innovations around uniforms and marketing have literally transformed how college football programs look at uniforms as part of their overall package, and because Oregon was the first, the Ducks’ options for uniforms are endless… literally. In an article on UniformCritics.com the reporter talks about what the Ducks have done when it comes to the uniform work since the Nike partnership with the University of Oregon began in 1996. From the Ducks sporting wings on every jersey they wear to bringing neon colors back to adding a sort of sparkle to the uniform or having iridescent style helmets the magic continues. The best part? Nike is still creating new uniform combinations for the program! Royce Freeman in the Kenny Wheaton inspired throwback jerseys. For true and loyal Duck fans, the style of the uniform they are wearing doesn’t actually matter all that much. It’s the game that matters and I think fans may get distracted by that sometimes. But for the most part, we all know who we’re rooting for and the real reasons why! Now, my fellow fans, my question to you is, what uniform have you liked the best in recent years? Do you like seeing our men out there on the field in fierce black with a pop of yellow? Or maybe forest green? 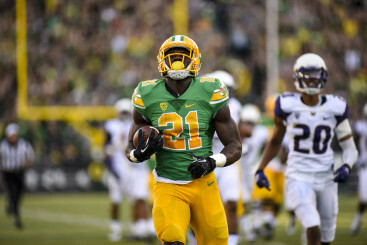 Or how about those throwback Kenny Wheaton jerseys when our Ducks faced the Washington Huskies in the 2014-’15 season? Personally, I like black and white with hints of bright yellow. Just about anyone can rock black or white and look good but in my opinion, our Ducks sport it the best.